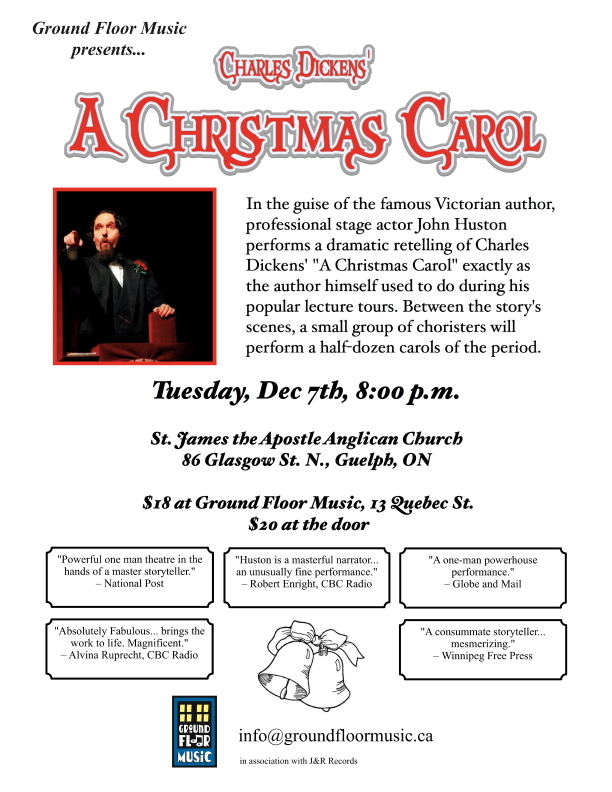 After a SIX year hiatus the Ground Floor Music Concert Series returns on December 7 with a reprise performance by John Huston portraying Charles Dickens, as he tells his classic yuletide tale, “A Christmas Carol” at St. James The Apostle Anglican Church in Guelph. This is NOT a reading, nor a recitation, but a dramatic tour de force. In the guise of the famous Victorian author, professional stage actor Huston performs a dramatic retelling of Dickens’ A Christmas Carol exactly as the author himself used to do during his popular lecture tours. Between the story’s scenes, a small group of choristers will perform a half-dozen carols of the period. If you have an interest in drama, literature or storytelling you really should see this show. Charlie Cares from Ground Floor Music will be our special guest on Royal City Rag on December 4 between 8-9 a.m. Remember, if you don’t catch Royal City Rag live, you can always pick it up later that day via the CFRU archive or on this website a day or so later.